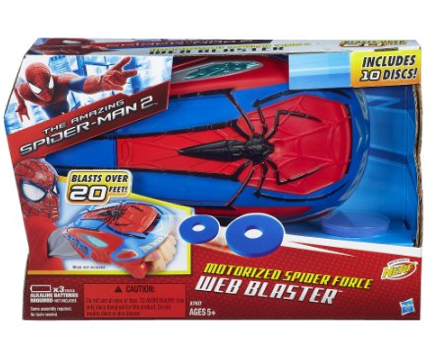 Marvel The Amazing Spider-Man 2 Motorized Spider Force Web Blaster $9.98 (Reg. $21.99)! You are here: Home / Great Deals / Amazon Deals / Marvel The Amazing Spider-Man 2 Motorized Spider Force Web Blaster $9.98 (Reg. $21.99)! If you have a little Spider-man fan running around, you may want to check out this HOT deal! Right now you can grab this Marvel The Amazing Spider-Man 2 Motorized Spider Force Web Blaster for only $9.98 (Reg. $21.99)!